Haze is a wet brush font with splatters all over its glyph and bears its own watercolor texture. The structures are fully randomized thus creating unique mind-bugging effect to words. 100% fully printable on shirts and products! Band logo, book cover, restaurant logo, album covers and brand identity are just a few which will be served by this one of a kind Typeface! Haze Light - The brighter version of Haze that produces a more wet look to words. Alternates are in the Uppercase. 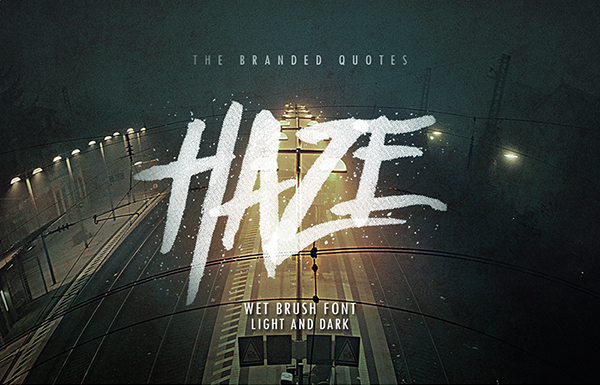 Haze Dark - Heavier look and solid splatters are on this version. Edges are more rough and its alternates are interchanged to the Lowercase of the Light version.